© 2014 C. Reichmuth, NMFS marine mammal research permit 14535. Please do not use photograph without permission. It is around 11 AM when I arrive at the Institute of Marine Sciences, Long Marine Laboratory, University of California Santa Cruz, USA. 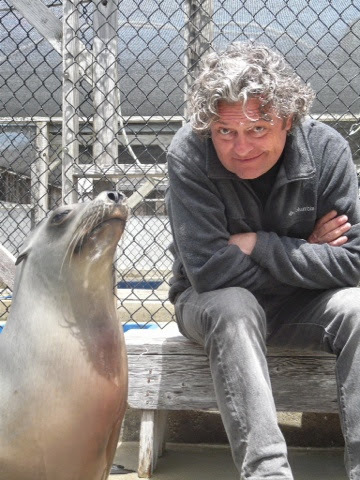 I will meet with dr Colleen Reichmuth and her team, who kindly invited me to observe some of the running audition and animal cognition experiments they do with pinnipeds. Her lab is the only one of its kind in the world, and well known for its inventive and high-quality research with sea mammals, both in the lab and in the field. I'm especially interested in meeting Ronan, the Californian sea lion that lives here since she was 1 year old (now being 6 years of age). She became close to a celebrity after a study that was carried out by Peter Cook at Reichmuth's lab in 2012. Unfortunately, Cook left recently for a postdoc elsewhere, so I didn't expect to see Ronan performing her amazing skills. However, Colleen Reichmuth, Jenna Lofstrom and Andrew Rouse surprised me with a demonstration of the original setup as described in Cook et al. (2013)! While Ronan didn't perform the experiment for more than a year, she was on top of it, to say the least. The sound of a metronome at different rates – from approx. 80 to 120 BPM– was promptly picked-up and synchronized to. Within two (or max. three) metronome clicks Ronan was in sync and sticked to the beat: Performing much better than the average human, I would say. Also with real music (the Boogie Wonderland example mentioned in an earlier blog) she had little difficulty to stay in sync with the beat of the music. After seeing Ronan perform, and in addition to the carefully controlled experiments presented in the 2013 paper that were convincing by themselves, there is no doubt whatsoever that this active animal is sensitive to the explicit or induced regularities in sound and music. The intriguing question that remains is: why do we (humans) share this capability with Californian sea lions, and not with other primates that are far more closely related? After the demonstration I was introduced to Ronan. She behaved like a rising star: patiently posing and even presenting a kiss on my cheek! A human is easily cheated..., but she made my day. N.B. The lab is currently exploring the vocal learning capabilities of Ronan in light of the vocal learning hypothesis that suggests that only animals with this trait are capable of rhythmic entrainment (see earlier entry). However, this has never been shown in Californian sea lions (Zalophus californianus) as yet. I'm sure more exciting papers from this lab will follow soon! See also blog at Psychology Today.